Over the last few months I've been using Vaseline's Intensive Care Repair Serum. The Intensive Care Repair Serum line is designed to help moisturize and heal dry skin and also helps moisture 10 times better than most moisturizers. I was sent all three types, the advanced relief, deep repair and radiance restore with pure cocoa butter. I've always been a fan of Vaseline. I use their petroleum jelly on my feet every night during the winter months to help my feet from cracking and being rough. So when I had the opportunity to try out their intensive care line, I was excited. The advanced relief helps heal and calm really dry skin with moisture. It's gentle on your skin and has the scent of rose and amber with a vanilla aroma. I loved using this on my upper body after getting out of the shower. The deep repair helps moisturizes and heal rough and dry skin. This was what I used on my feet every night before bed, which not only helped my feet stay hydrated, but also kept my feet soft and smooth and feeling great. Lastly I tried the radiance restore with pure cocoa butter. I didn't use this daily like I did the other two, but I did use it maybe twice a week as it helps dry, dull skin and leaves you with the great smell of cocoa butter, one of my favorite scents. All three products worked fantastic on my skin and are a must have year round. They work great in the summer and I can't wait to use them this winter to help my skin stay hydrated during the cold months. Vaseline Intensive Care Repair Serum retails between $7.77-$11.49 and can be found at most drug stores and grocery stores. 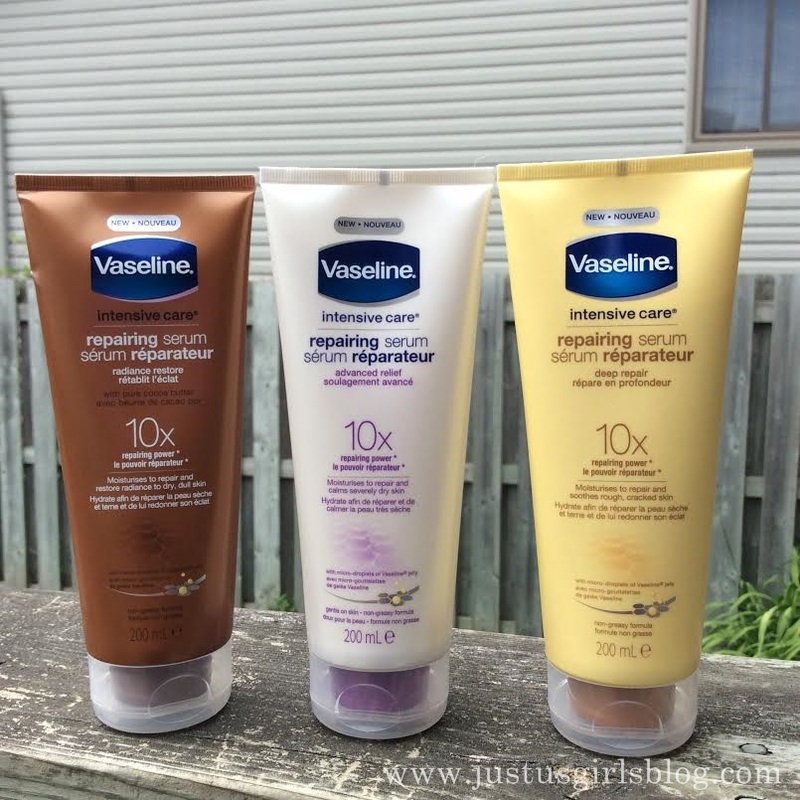 For more information about the Intensive Care Repair Serum line and other products from Vaseline be sure to head to vaseline.ca.